A little girl from Filton has climbed Snowdon to raise awareness of a very rare genetic condition. Nine-year-old Freya Williams attends Filton Avenue Primary School’s Orchard Campus and lives in Filton Park. Her little sister Saskia Williams, aged four, suffers from Williams Syndrome and Freya decided that she wanted to do her bit to raise awareness of this rare congenital disorder. Williams Syndrome occurs randomly and affects around one in 18,000 people in the UK. There are around 3,500 known cases, and the cause of Williams Syndrome is a tiny deletion of part of chromosome 7. It is non-hereditary and causes distinctive facial characteristics and a wide range of learning difficulties. Many sufferers have hypersensitive hearing, with fears of loud noises and have a minor but treatable heart condition, and all tend to be talkative and excessively friendly towards adults. In preparation for her hike on Saturday, August 23, Freya did five practice hikes of increasing difficulty at Stoke Park, Blaise Castle, Cheddar Gorge, a Cornwall coastal walk and finally Sugar Loaf in the Brecon Beacons. Commenting on Freya’s fundraising and training, Richard added: “On the first day of training it dawned on Freya how hard this would be and she was very worried. However she got past all the pain and worry on the way up and did it! “Climbing Snowdon itself took seven and a half hours. We started in beautiful weather, had gales at the top and were soaked through by the end. It took four hours to climb and she did find the climb hard on her legs. However, she flew down in two and a half hours, all the time with a smile on her face. 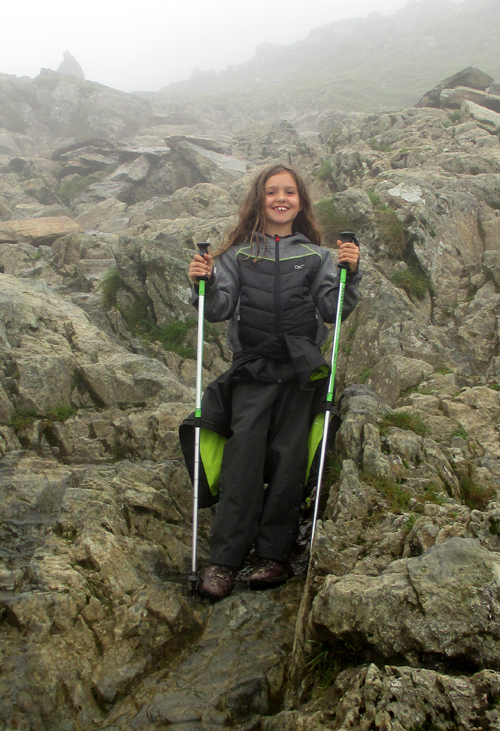 “Freya set out to raise £500 and do something she has never done before.